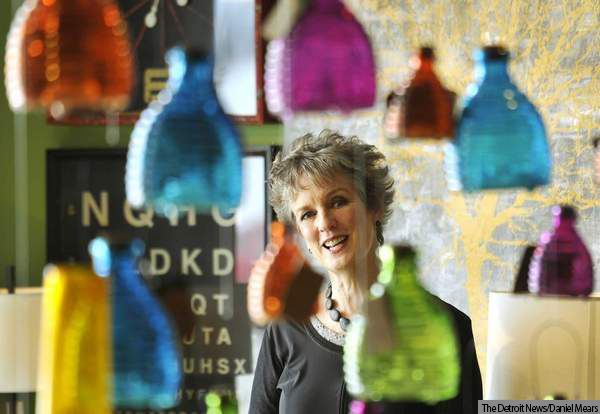 June 5, 2013 (Clawson, MI) – Today, Mary Liz Curtin, co-owner of Leon & Lulu, a destination lifestyle store in Clawson, Mich.,was named a Michiganian of the Year 2013 by The Detroit News. For 35 years, The Detroit News has “tipped its newsboys cap” each year to some of the state’s most inspiring people. The organization has saluted more than 400 individuals whose excellence, courage, philanthropy or simple acts of kindness uplift not only the metropolitan area, but also all of Michigan. This year’s designees include Curtin, who was selected by the News for her many community contributions, including hosting several dozen charity fundraisers at Leon & Lulu each year. “I’m absolutely surprised, delighted and humbled by this designation by The Detroit News,” says Mary Liz Curtin, co-owner of Leon & Lulu. “We enjoy keeping busy within our community and are fortunate to have the space and right atmosphere to host so many charitable events. We’re thrilled to receive such and honor, and hope to keep doing what we’re doing for a long time,” says Curtin. Leon & Lulu also won The Next Big Give put on by the Dallas Market Center, which recognizes specialty retailers that make a difference in their communities. Curtin was also the named Best Independent Store Owner in Hour Detroit magazine’s June 2013 Best of Detroit readers poll. This year she was invited by The Wall Street Journal to be a small business contributor to The Experts, an exciting new online forum at The Wall Street Journal. She also received the ICON Honor for individual career accomplishment from AmericasMart Atlanta in partnership with GHTA and HFN. Leon & Lulu also won Best Furniture Store and Best Unique Shop in the Daily Tribune’s 2013 readers poll, and Best Place to Find Home Décor in Real Detroit Weekly’s 2013 Best of Detroit contest. About Leon &Lulu: A destination lifestyle store featuring an eclectic mix of upscale furniture, unforgettable gifts, and accessories in an environment unlike any other. Located in the historic Ambassador Roller Rink in Clawson, Michigan, Leon & Lulu offers 15,000-square feet of fabulous shopping, with a new 7,800-square feet expansion into the neighboring Old Clawson Theatre slated to open this spring. Locally owned and family run, Leon & Lulu prides itself in providing a fun, welcoming atmosphere, serving hot coffee, cookies and popcorn – often via roller skates – to visiting patrons. For more information, or to shop online, please visit www.leonandlulu.com.